Our next tattooed poet is Danielle Shutt., who sent us two photos. In this case, a grande margarita and my friend Kristen did the trick. Kristen accompanied me to River City Tattoo, where a nice guy named Reverend Bob tattooed the symbol on my wrist in less than three minutes. I was happy with it. I always will be. I get asked all the time about what the tattoo means, which is cool because I love talking about my sibs. 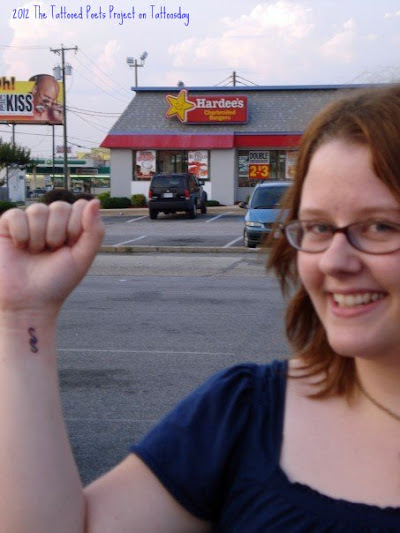 I still think of the tattoo as a comfort, but more often these days it reminds me of my brother and sister's hard-fought survival, which in turn reminds me to stay strong, too." to beg off new bruises. isn't as stark as I'd expected. pulling slow on these back roads. Danielle Shutt completed her MFA in Creative Writing at Eastern Washington University in Spokane, WA, where she taught writing courses and served as a poetry editor for Willow Springs. Her poems have appeared or are forthcoming in Hayden's Ferry Review, Redactions: Poetry & Poetics, PANK, Copper Nickel, DIAGRAM, and Hotel Amerika. Thanks to Danielle for sharing her tattoo and poem with us here on Tattoosday!